Hart’s-tongue fern Asplenium scolopendrium is quite uncommon in Assynt, especially away from the limestone in the east of the parish. 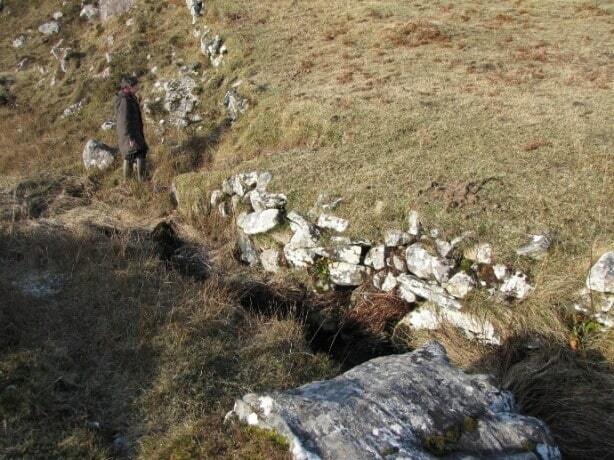 There is a flourishing population in a horizontal fissure in gneiss at the edge of Loch na Uidhe Diomhne, and plants have also been found on mortared buildings or walls at Ardvar, Lochinver and Rhicarn (probably now gone) and, recently, in a pile of boulders beside the road at the eastern end of Loch an Ordain, Clachtoll. 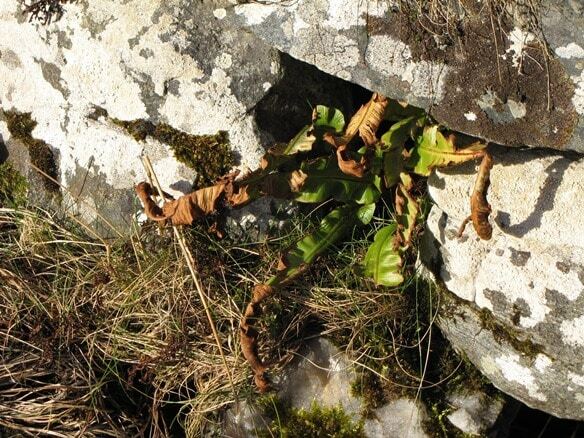 On 13th February 2015, Gwen Richards and Pam Mackenzie found this fern in a new site at Achmelvich. Some six clumps are growing in an old field wall just below the track to Alltan’abradhan (NC0625), and Gwen found another further up the wall two days later. Near the main group are numerous plants of the maidenhair spleenwort Asplenium trichomanes and, further up the wall, a few plants of the black spleenwort A. adiantum-nigrum, but none of these three ferns appear to occur on nearby outcrops. The soils in this area are enriched by sand blown up from the beach, which contains shell fragments, rich in calcium carbonate. The field wall runs along the edge of a small burn, so the ferns are benefitting from fertile soil, a humid environment and protection from grazing afforded by the wall, which was probably built to enclose an area for cultivation. How long the hart’s-tongue has been there and where the spores originated, we may never know, and no-one has previously noticed it.